The final port in our Alaska cruise, wasn't in Alaska, it was Victoria Island in Canada! Unlike our ports in Alaska, Victoria Island had warm, summer weather. We arrived in the early evening and stayed in port until Midnight, although with the kids, we were back on the ship before ten. This was Zoe and Felix's first trip to Canada! On this summer vacation we were able to take them to three new states (Alaska, Oregon, Washington) and a new country. We did not book any excursions in Victoria, but we had originally thought that we would take a bus into town. The bus ride into town was also a tour, which wasn't what we were wishing to do. Plus, it was VERY expensive. We walked. The walk takes about twenty minutes and it's through a quaint residential neighborhood. We even found a park for the kids to play. We visited during Victoria Island's Canada 150 concert, part of a series of celebrations across Canada to celebrate the 150th anniversary of the country. Tegan and Sara were performing on the open-air stage as we walked around the area. The police presence was very high at the event. Felix got the shock of his life when a police officer suddenly grabbed him, pretending to arrest him. We all laughed, but it made me realize that something like that would never happen in America. The parents would probably sue! The Canadian police were all very friendly and let us take a picture with their big van. The prettiest area is down by the waterfront. The last time Dan and I visited Victoria Island we ate amazing fish and chips from a food truck run by two English guys. We had hoped to eat there again and headed to a cluster of food trucks parked by the waterfront. Unfortunately, the fish and chips truck wasn't there. Instead, we just went for an easy choice and all had hot dogs from the Hungry Rooster truck. For dessert, we shared a bag on mini donuts from the Island Mini Donuts truck. One of the best stores on Victoria Island and certainly a place that all bibliophiles should visit, is Munro's Books. Munro's Books was founded by Nobel prize winning author Alice Munro. It's a wonderful bookstore and has the friendliest staff around! My "to-be-read" pile is out of control, so rather than purchasing a book, I started a new tradition. I bought a Munro's Books tote bag and a few book themed pins. Since last year, I've added to my pin collection that I'm pinning on the tote bag. This new book themed tote bag is going with me to book fairs and conventions. I recently added to it on my trip to England with pins from Blackwell's Bookshop in Oxford and Charles Dicken's house in London. We ended with a walk back to the port, taking a look at the government buildings with the sunset. In 2017, home was Portland, Oregon, so we got excited when we saw Oswego Street. And the last picture of the vacation: Dan and the kids in front of The Kraken food truck. This is a bit of an inside joke that anyone who has been to our house for a party will understand. A cruise to Alaska ( with a stop in Canada) is a great way to see different areas of our remote and wild 49th state. It's a must for nature lovers and a great area to cruise with kids. Our last port in Alaska was Ketchikan, aka: "The Salmon Capital of the World." In addition to all of that salmon, Ketchikan is known for being the first city in Alaska. And also known for: Lumberjacks. Our stop in Ketchikan was short and we arrived very early in the morning. We had one excursion booked; The Great Alaskan Lumberjack Show. Dan and I did not do the lumberjack show on our previous trip to Ketchikan, but after hearing how much everyone enjoyed the show, it was on our must-do list for this trip. The show is located across town, about a fifteen minute walk from where the Ruby Princess was docked. Here are the pictures that we took as we walked through the town. The Great Alaskan Lumberjack Show lasts about an hour and is held in an open-air arena, with first come-first serve seating. The show centers around competitions between two pairs of lumberjacks, one pair from America and the other from Canada. It is similar to Medieval Times, in that depending on where you sit, you are either rooting for the Canadians or the Americans. All of the lumberjacks play a different character to give it a bit of a storyline. For example the "bad boy" lumberjack was on the Canadian side and he was a sore loser which ramped up the rivalry. The American side had a slightly goofy, bad-boy character too. With regard to the actual events, It was hard to tell how much was predetermined and how much was actual competition. That said, it is a fun, high-energy show and clearly, the lumberjacks are all very talented. They did log-rolling, wood carving, axe throwing, sawing, and the final competition, where one lumberjack from each side had to climb up a tall tree. These are all skilled athletes, no matter how much of it may have been staged. We rooted for the home team, but I can't remember which side actually won. It was a close competition throughout. The excitement wasn't so much in who won, but in the actual competitions themselves. 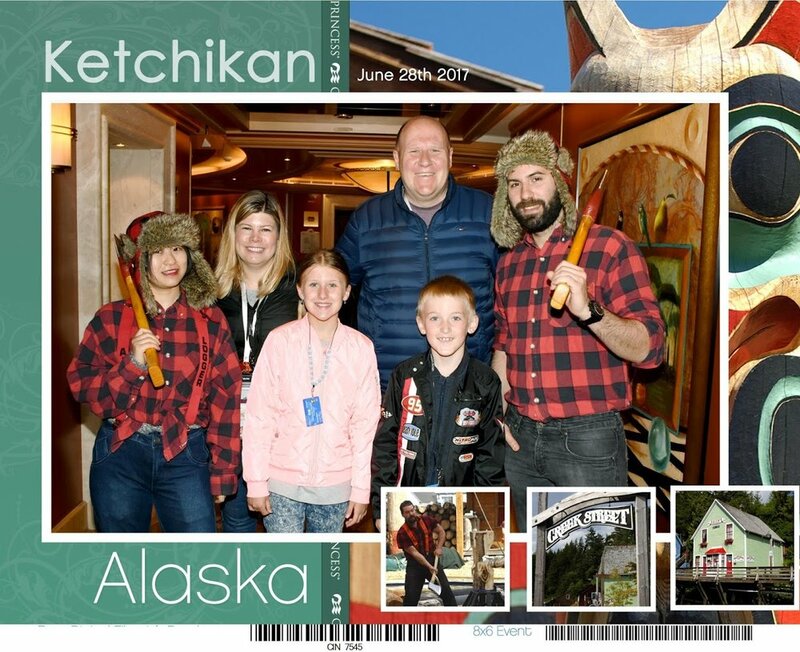 If you're heading to Ketchikan, The Great Alaskan Lumberjack Show is a perfect pick for the entire family. This is also a very short port stop, so this excursion will leave enough time for you to enjoy the town. The kids got a picture with a lumberjack. This guy was one of the "nice" characters. Dan wasn't feeling well, so he headed back to the ship and I took the kids around the town. Ketchikan has a small indoor mall with an outlet store, where we stocked up on Alaska souvenirs and had a sugary treat. Like the other ports, a lot of the stores in Ketchikan are tourist traps. I'm not sure what it is about cruise ports but they seem to be the place where people go to get jewelry. There are so many jewelers in Ketchikan and all of them had some kind of free trinket to entice buyers to enter their shops. We navigated around these stores, but we were lured in by a store selling items that change color in the light. I bought Zoe color changing nail-polish and Felix a tee-shirt, both were big hits. Our morning in Ketchikan was a blur and before we knew it, we were back on the ship and enjoying an afternoon of swimming as the Ruby Princess headed to its final port, Victoria Island in Canada. Midway through our cruise on the Ruby Princess, we spent a day-at-sea cruising through Glacier Bay National Park and Preserve. Our ship slowly cruised through the five-mile inlet, getting close to the Margarie Glacier. On our previous cruise, we visited the Hubbard Glacier, which was quite a bit bigger and more dramatic. While we only saw a few calvings on this trip, we saw many at the Hubbard Glacier. It's still exciting when it happens and we were happy that the kids got to experience it. The other thing that I noticed on both cruises, is the sounds that the are made by glaciers. When it calves, it sounds like a crack of thunder, and when the ice is melting in the water, it sounds like a glass of 7-Up fizzing. Park rangers were brought on board to talk about Glacier Bay and answer questions. The kids club offered a "Junior Rangers" program. We skipped all of the activities and simply enjoyed the views. As you might imagine, it's super cold being so close to a glacier. Although we all had winter coats, Dan is the only one who thought to bring a hat. Zoe and Felix are tough Swedish kids, so Dan let me borrow his cozy hat. Who wore it better? Dan created this awesome time-lapse video as we sailed away from the Margerie Glacier. There were plenty of animal sightings: eagles, whales, and sea lions, as we made our way out of Glacier Bay. This island was covered with sea lions sunning themselves. Or perhaps, wishing they were able to catch some rays. Zoe and Felix were eager to swim, so we spent the afternoon poolside. Dan and I stayed bundled up and enjoyed cocktails, while the kids enjoyed the pool. The Bailey's cart was a great surprise! Coffee with a shot of Bailey's = yes please! Every now and then, they would announce a whale off the side of the ship and everyone would run over to take a look. Another surprise was fish tacos from the Ketchikan Fish House were being served as a teaser for our next port: Ketchikan!